Elder Neglect and Abuse is unacceptable…PERIOD. Caregivers in nursing homes – nurses and aides – are hired and trusted to provide professional and compassionate care with a polished set of morals. The RULE: Do No Harm. Many people ask: What factors cause nursing home abuse? What are the warning signs I should be watching for? How and why does nursing home abuse happen? Between 1946 and 1964, America saw a lot of prosperity and in turn the birth rate saw an impressively significant increase across the country. The youngest of these designated “Baby Boomers” have just hit 50 years old. America is projected to have 1 in 5 Americans to be at 65 or older by 2030. As we see more elderly individuals becoming a part of American society, this has opened up a dire need for many more retirement, assisted living and nursing homes. People are also living much longer today than a generation ago. This all adds up to more people in need of more care for longer periods of time. There is a shortage of qualified nurses, aides and caregivers to care for the increasing older population in nursing homes and other elder care facilities. This combination increases the risk of poor care, injuries and Wrongful Death. 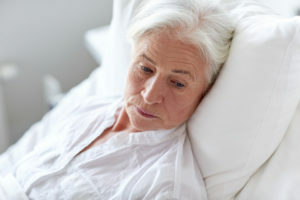 With a rise in an elderly population and a rise in nursing home abuse reports, studies have been conducted in order to identify common causes of such neglect and abuse. The more we understand how mistakes and neglect happen, the better the chances to prevent it. Understaffing (not having enough employees on the job) is one of the most common causes of nursing home neglect and related injuries such as falls and bedsores. Not having enough employees watching and caring for the elderly can result in missed medical symptoms, poor cleaning, and forgotten residents. Neglect often occurs from understaffing because workers are overwhelmed with how many people they must take care of and how many responsibilities are expected of them. Severe stress and fatigue lead to mistakes including medication errors, fractures, malnutrition and dehydration. In the worst cases, pressure from overworked nursing home staff leads to physical and mental abuse of the elderly. With elders being fragile and sometimes helpless, workers may take out their own stress and pressure on the people they are supposed to be caring for. Maybe they strike a resident, pull them too hard in frustration, or purposefully ignore their calls or “call bells” feeling as if having to care of them is some sort of punishment. Proper staffing of nursing homes should be a top priority of any company owning and operating a nursing home or assisted living facility. Seniors in nursing homes and other care facilities deserve to be treated with respect and dignity. Nursing home staff needs to ensure that residents are safe and secure at all times. If your loved one suffered an injury, or worse, due to nursing home negligence or abuse in New Jersey, you need to speak with a qualified attorney. The experienced nursing home neglect attorneys at the Sugarman Law Firm represent clients throughout New Jersey, including East Orange, Vineland, New Brunswick, and Union City. Call (732) 877-1975 or fill out the online contact form to schedule a free consultation today. We have an office conveniently located at 80 East Main St, Somerville, New Jersey 08876, as well as an office in Marlton, New Jersey.